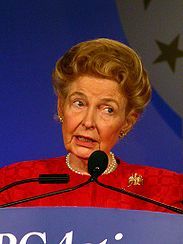 Conservative columnist and anti-feminist writer Phyllis Schlafly has a few zingers for New Year's Resolutions including instituting a ban on violent videogames. Videogames: "There shall be no sale, rental or arcade-playing of extremely violent videogames by children without parental consent." Explanation: Videogames are increasingly graphic and harmful. There are a number of things wrong with this statement, which takes some things for granted while simultaneously presenting a very outdated impression of the videogame industry. First off, who plays games in an arcade anymore? It's like Schlafly is stuck in the 1993 Mortal Kombat controversy. The actual content of the resolution is something that I generally agree with - there are a bunch of games that I wouldn't want my child to play - but I don't think that legislating it is a good idea as it will lead to abuse. The tone of Schlafly's "explanation" is the real problem here, though. It disturbs me that an intelligent person such as Schlafly clearly takes the fact that videogames are inherently harmful as a matter of fact. Well, we do not hold these truths to be self-evident. There is no actual evidence that videogames are harmful in any way or that they encourage negative or violent behavior. The recent Supreme Court arguments prove that not even the State of California could come up with compelling evidence that significantly swayed the opinions of the highest court in the land. I guess I shouldn't be surprised. Reading the rest of Schlafly's resolutions leaves me equally stupefied. You think it's that important that Good Friday become a State Holiday? Or that it's worth writing a law against companies who "discriminate against the Boy Scouts"? Really?